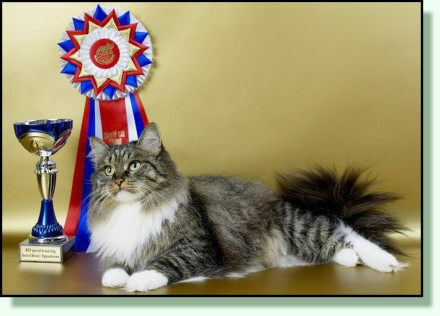 I am pleased to welcome you to the Tomsk Siberian cats cattery "Sladkoe Pyatnyshko". It has begun its history in 2000, when my family was enlarged with our first Siberian cat Zonusia. Our cattery is small, and all pets are members of the family, they are involved in all home affairs. They manage to be everywhere: they help in the kitchen and with cleaning the apartment, and in the evening reading. And how they like to watch the rest from a height! Sometimes it seems that cats know and understand us better than we are. The purpose of our cattery - is breeding Siberian cats with recognizable type that is the most relevant to standards, with good health and a wonderful character. In the cattery has grown four world champions in WCF – Tzvetana Sladkoe Pyatnyshko, Iskander Sladkoe Pyatnyshko, Vivat Sladkoe Pyatnyshko and Ratibor Sibmarina. Today in the cattery there are 4 producing cats: famous Eur.Ch Charovnitza Sladkoe Pyatnyshko, GrEur.Ch WCF & Ch TICA Lyubava Sladkoe Pyatnyshko, Eur.Ch WCF & Double Gr.Ch TICA Koritza Sladkoe Pyatnyshko and youngs Ch. Chara Sladkoe Pyatnyshko and Danuta Sladkoe Pyatnyshko. They live in my family, but the male cats live in the family of my good friends Oksana and Sergei Melnikov – they are W. Ch. Iskander Sladkoe Pyatnyshko (he had already retired), W.Pr. Vivat Sladkoe Pyatnyshko, W.Ch. Ratibor Sibmarina and young Egor Sladkoe Pyatnyshko. In the family Oksana and Yuri Ponomarenko lives future breeding maleInCh. Gladness Ray Borey with a beautiful and rare colors - red classic with white. Another future producer of our cattery Konyak Angara lives in the family of Angela and Alexander Kulikov. Graduates of our cattery now live across Russia – Tomsk, Jurga, Novosibirsk, Petrozavodsk, Petropavlovsk-Kamchatsky, Volgograd, Voronezh, Moscow, Kostroma, Ufa and Vladivostok. They can be also met in other countries - Finland, Poland, Belgium, Germany, the Netherlands, the USA, France, Great Britain and Australia. On our website you will find information about the Russian native Siberian breed. The unusual combination of tenderness and rampant look, the natural beauty and harmony – all of this attracts the attention of connoisseurs and delights fans of Siberian cats. You can talk about Siberian cats for a long time, but much more interesting is to watch them. And we want more people to appreciate the wild glory, grace and inner beauty of these animals. Here you can choose a kitten, healthy, beautiful and good-tempered. And let it be a good and faithful friend for you! Enjoy! We hope to see you again on our site!